Steve Carter, one of our Careers Consultants, gives his tips for students wanting to work in Leeds or the surrounding area after graduating. Every year there are a number of students who, after enjoying their time here at Leeds, want to stay in the area. This could be for the city life that Leeds has to offer, access to the Yorkshire countryside, or because of friendships they have made in the locality, and probably for a combination of all three. How viable is it to find a graduate level job in Leeds and the surrounding areas? How can you go about accessing these employers and their vacancies? In the first instance you can look at our jobs database on the Careers Centre website. Currently we have 259, one-third of our vacancies, in or around the Leeds area. 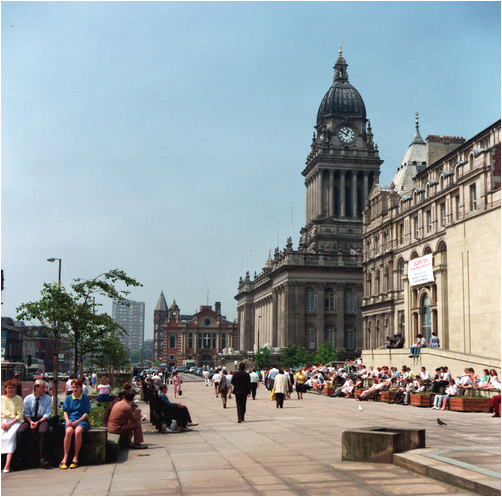 These can be divided up into three main categories: large employers who have a global reach, such as Deloitte, PwC and KPMG who have offices in Leeds; national employers such as Enterprise-rent-a-car and ASDA; and local employers whose businesses, whilst located in Leeds, offer work beyond the locality and indeed the country. These include Walker Morris, a legal firm and Sagar Wright, a recruitment consultantancy. Other sources for graduate vacancies include Graduates Yorkshire and the Yorkshire Post. For the latter all you need to do is to type ‘graduate’ into Keywords to get, the last time I looked, 89 graduate vacancies. A similar process is required for the You Gov website. Allow for the fact that there may be some cross-over of vacancies on the above sites but you will find that by no means all companies are on all sites. This is especially the case for some of the smaller organisations who cannot afford to advertise across all platforms. This brings me on to perhaps the largest but untapped source of opportunities for graduate jobs, the ‘hidden’ jobs market. Did you know that up to 80% of all jobs are not advertised? These jobs are usually to be found with Britain’s largest employment sector, which is, conversely, with the smallest organisations: Small, Medium Sized Enterprises, or SMEs. These organisations, comprising 99% of all British businesses, employ fewer than 250 employees and although the larger of these may advertise some of their vacancies, a lot will recruit via word of mouth or when they are approached in a speculative manner by people who want to work for them and who feel they have the right skills to offer them. This latter approach to finding graduate vacancies can be fruitful but hard work, but if you want to stay in Leeds and don’t want to work for some of the larger organisations mentioned above, it may be the way forward. It involves lots of thought, i.e. researching the sector you are interested in and thinking about what you have to offer with regard to skills and experience. You will need tenacity and resilience as you are likely to encounter lots of ‘no’s’ before securing a ‘yes’. Networking skills will be useful, as people who work in the particular sector are likely to have up to date (and local) knowledge of the sector, as well as potentially knowing others who may come up with that invaluable ‘yes’. And, a little bit of luck; you have to be approaching a company just at the time they need somebody to do a job for them! Other things you might want to consider if you are intending to stay in Leeds are the Yorkshire Graduate Fair on Wednesday 5th June 2013 and the Leeds Internship Programme. The former has a ‘Local Zone’ which will comprise of 30 local employers and the latter is a programme of internships situated in the Leeds area, exclusive to Leeds students and graduates and paid at £300 per week. Leeds Internships will be with local organisations, including charities, and professional services departments within the University and may be either summer or 12-month undergraduate internships, or graduate internships later in the year. If you want to find out more about these internships you can register your interest in the programme by e-mailing workexperience@leeds.ac.uk (including your current year of study), sign up for one of the forthcoming information sessions here (Undergraduate workshop on 6th March or the Finalist/Graduate workshop on 13th March) or follow #LeedsIntern on Twitter. One last thing about networking: I got my current job here at the Careers Centre by talking to people at Leeds Met who alerted me about an up and coming job here at Leeds. So, that combination of putting something in, and getting a little bit lucky! Best of luck with your job hunting strategies.